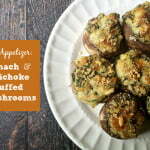 This Spinach and Artichoke Stuffed Mushroom dish is the easiest appetizer to make. Easy, low carb and lots of other things you can do with the left over dip. Even make the night before. Scoop out the mushroom stems to make a bowl. Add dip to mushrooms and then sprinkle with cheese. Bake for 30 minutes or until mushrooms are cooked. Broil the last few minutes if they need to be more brown on top.